I was backstage at Disneyland, just behind the backstage entrance near “it’s a small world”. My high school marching band had just finished parading, marching down Main Street USA and beyond Sleeping Beauty’s Castle. With the gates now closed behind us, the band began setting down their instruments, taking off their uniforms, relaxing. I, however, was not. I was crying. I was happier than I had ever been in my entire life. I had just marched down Disneyland, an absolute dream come true. As I sat there backstage, alone and still crying, a hand patted my back, and a voice told me simply… “Walt would be proud.” (That certainly didn’t help stop the tears, if anything it brought on an onslaught of more, but only because it resonated so deeply in my sophomore-age heart.) Certainly, that sentiment seems fluffy and shallow, and if you were to think too much about it, you might be able to disqualify the statement entirely. But such meant so very much to me then, and still continues to mean so very much to me now. Today is Walt Disney’s birthday, and in honor of such, I simply wanted to share a bit of what this man has done for me in my life, much of which I am certain you will heartedly agree with. I have never met Walt Disney. I will never meet Walt Disney. My knowledge of him only extends so far as the knowledge his closest associates have shared. 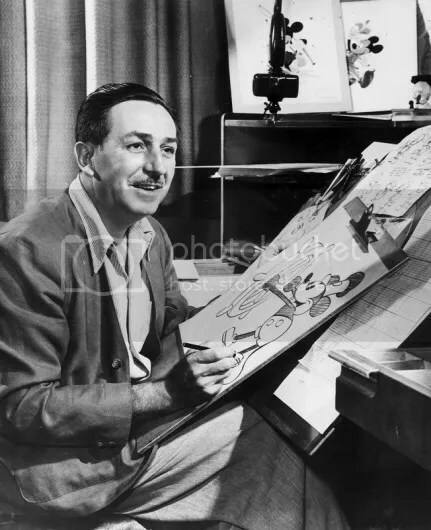 Yet in learning more of this “man behind the mouse,” I found a man who helped to create my dreams, and then taught me how to make them come true. He taught me, and still teaches me, of imagination, optimism, spirit, and ingenuity. Walt Disney has inspired me and will continue to inspire me. At the end of each and every trip to Disneyland, I sit myself on a bench near “Partners”, the commemorative statue of Walt with Mickey Mouse. I sit under the twinkling lights in the trees, with tired guests walking past me for one last photo of the castle. Many families stop and look at Walt and Mickey, and many small kids have turned to their folks to ask, “Mom, who was Walt Disney?” Their answers never fail to bring tears to my eyes. “He was a magical man who made Disneyland,” some say. “He was remarkable, he had so many dreams.” “He’s who you have to thank for the wonderful time we’ve had at Disneyland.” I stay on that bench until security asks me to leave, but until they do, I have little conversations with Walt. I report back on my dreams. It’s a tradition of mine I’ve been doing since I was 12. I make sure I am doing him proud. And to all of us dreamers, hoping to carry on ol’ Uncle Walt’s legacy, I’m sure we’re doing him proud. 111 years ago today a man who would alter the course of entertainment was born. Though most would not be aware for quite a few more years, the effects of his influence continue to be felt to this day, some 40 plus years after his passing. The accomplishments of Walter Elias Disney are quite numerous and can be found on many websites, books, and documentaries. They can be witnessed through animation shorts such as “Steamboat Willie” and “Flowers & Trees”, feature films such as “Snow White and the Seven Dwarves” and “Mary Poppins”, and in theme parks worldwide. His legacy is evident in the company name alone. To many people, the adoration of the man can tend to near the point of worshipping the man; faultless and amazing at every turn. The man who believed in the power of dreams and imagination – a true hero worship. I personally find myself fascinated with him because he was human. He had many failures, financial struggles, bad ideas, could sometimes be gruff, even impersonal to many he worked with. Yet through it all, he was also a hard worker, a master storyteller, a man with outlandish and genius ideas. Yes, a dreamer with a huge imagination. But someone who was willing to work and sacrifice to make those dreams come true. Someone who would learn from his mistakes and keep moving forward. Someone who didn’t take no for an answer. That’s the man I admire and pay tribute to today. So happy birthday, Walt. Thank you for your contributions you made to animation, film, music, theme parks, technology, and so much more. Thanks for being the man behind the magic – and for making that magic happen with hard work, determination, stubbornness, and yes, dreams. Millions of fans, both casual and otherwise, are grateful.